My original idea was to create a Sunday-size puzzle with a full 9x9 Sudoku grid in the middle. Even if you let black squares substitute for one of the nine letters, however, I'm pretty sure this can't be done. So I decided to try a 4x4 grid instead. This was definitely simpler, as I could alternate vowels and consonants and use just a few common letters. But a 4x4 square (and the entries that use it) isn't really enough theme material. I saw that I could add SUDOKU / PUZZLE and CENTRAL / SQUARES on the top and bottom rows and that would spread the theme material out. It also gave me a lot of bottom row letters that are hard to work with! The sudoku grid is also pretty hard to work with and required lots of black squares nearby to make the fill work. This puzzle's wacky theme (Will's e-mail to me started "Well, your "Sudoku 2x2" is crazy ... but in a fun and novel way.") is matched by the wacky grid: 16x14, no long theme entries, lots of short entries, but also several mid-length nontheme (hopefully fun) ones. I'm glad to get my tenth solo NYT puzzle published, but if it's not your cup of tea, feel free to say I HATE YOU. Many people have approached me for feedback on SUDOKU / PUZZLE crossword concepts, but I can't remember something quite like this. Todd gives us a mini-SUDOKU, with the letters A E R T in the middle 4x4, each letter showing up exactly once in each row, column, and 2x2 region. It's very easy to fill such a 4x4 with those letters to fit that SUDOKU property. But it's mighty hard to do so in a way that facilitates integration into a crossword. I can only imagine how many permutations Todd must have tried before landing on this 4x4 layout. I think Todd did fairly well in the center, with mostly fine entries like CARET and RATES. Neat to get some bonuses: DIETARY, ITERATE and ANTEATERS. HERAT is tough, but it seems crossworthy(ish), given that its population is over 400K. Thank goodness the H in MARSH had no ambiguity. My only real wince — and it was a big one — was at PSSST. One might argue it's arbitrary how to spell that sound. But I've seen it in print (not just in crosswords) as PSST so often that it feels right like that. PSSST opens the door for unfortunate entries such as AAAAH, OMMM, etc. Where I thought Todd shined was in some of the big, open corners. Even that opening corner is tough, given that it's a 7x4 chunk of white space. To work around CENTRAL so smoothly (just LDS = Latter Day Saints), and even feature THE EMMYS = a great way to kick off the puzzle. And that lower left! Working around two Zs can be tricky, so to feature HAIRCUTS with a fun [Tops off?] clue, and I HATE YOU is fantastic. Some may argue that Daniel INOUYE is esoteric. But educated people ought to at least be familiar with the highest-ranking Asian-American in the history of U.S. politics. I would have liked some rationale as to why A E R T were used (not just because those were four letters that worked) — and some revealer to rationalize why a mini-Sudoku — but all in all, a creative idea with generally good execution. 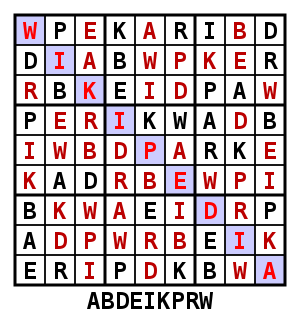 The grid uses 22 of 26 letters, missing GJVX. Average word length: 4.84, Scrabble score: 306, Scrabble average: 1.66.